After lots of rumors and leaks, Lenovo-owned Motorola has announced the Moto C and Moto C Plus phones. A slide showing the two phones was earlier leaked online by Twitter user Evan Blass, and now Moto C, Moto C Plus availability has been announced by the company. The ultra-affordable handsets are aimed first-time smartphone buyers in developing markets and will hit various countries across Latin America, Europe, and Asia Pacific this spring. The Moto C will be available in a 3G version, starting at EUR 89 (roughly Rs. 6,200) with 1GB RAM/8GB storage, and a 4G option starting at EUR 99 (roughly Rs. 6,900) with 1GB RAM/8GB storage. Moto C and Moto C Plus will become most budget-friendly Moto phones in the market, replacing the Moto E, which earlier represented the budget series. As for specifications, the Moto C runs on Android 7.0 Nougat and features a 5-inch FWVGA (480x854 pixels) display. The smartphone is powered by a 1.1GHz MediaTek MT6737M quad-core Cortex-A53 SoC with just 1GB of RAM. Storage options are at 8GB or 16GB, which can be further expandable via a microSD slot as well (up to 32GB). 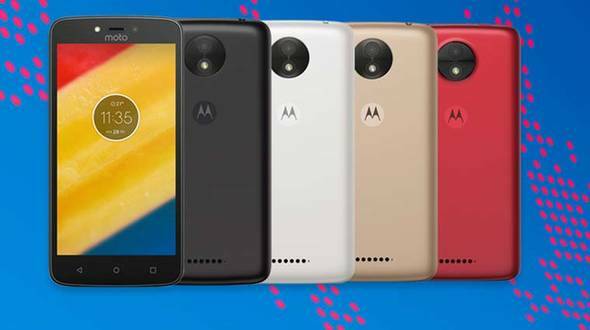 Moto C camera sports a 5-megapixel rear sensor with 1.4-micron pixels, 74-degree field of view, fixed focus, a LED flash, and 720p video recording. In the front, there is a 2-megapixel shooter with 1-micron pixels, a 63-degree field of view, fixed focus, and a LED flash. The Moto C sports a 2350mAh battery which is removable. The dimensions are at 145.5x73.6x9mm, and the smartphone weighs 154 grams. The Moto C will be available in Metallic Cherry, Pearl White, Fine Gold, and Starry Black color variants. The Moto C Plus is very similar to the Moto C with respect to design, but there are some areas with respect to specifications where it surpasses it. For example, the Moto C Plus sports better battery life, rear camera, CPU frequency, and display resolution. The Moto C Plus features a 5-inch (720x1280 pixels) display and is powered by a 1.3GHz MediaTek MT6737 quad-core Cortex-A53 SoC paired with 1GB or 2GB of RAM (depending on the variant). Inbuilt storage offering is at 16GB. Optics include an 8-megapixel rear camera with f/2.2 aperture, 1.12-micron pixels, autofocus, 71-degree field of view and a LED flash. The biggest improvement is seen on the battery side, with the Moto C Plus sporting a 4000mAh battery. The Moto C Plus dimensions’ measure 144x72.3x10 mm, and it weighs 162 grams. All the other specifications match with the Moto C.
Lenovo said last year that all future Moto smartphones would come equipped with a fingerprint sensor, but neither the Moto C nor C Plus appears to feature a built-in scanner. Moto C and Moto C Plus seems to be the good entry-level phones for the first time android or smartphone users with the great price.